The New Year is upon us. It is a time to close the book on 2013 and reflect on what this past year has brought us, however we must also look forward to creating a prosperous 2014. The legislature has reconvened for the final year of the 2013-2014 legislative session and I know there will be many tough decisions ahead as my work in Sacramento begins. On January 9th, the Governor unveiled his budget proposal for the 2014-15 fiscal year. Although the state’s budget picture has brightened, the real work will begin when my colleagues and I evaluate the different priorities to achieve a balanced budget that also invests in protecting California’s future. While I am working hard to represent you in Sacramento, I am also working here in the district to ensure that you are kept informed of services and opportunities available to you. In this month’s newsletter you will find information on Cash for College workshops being held locally. The workshops will connect you with financial aid counselors and help to make college more affordable. In addition, there is also information on neighborhood coffees that I will be hosting throughout the district to meet my neighbors and discuss issues of importance in our community. 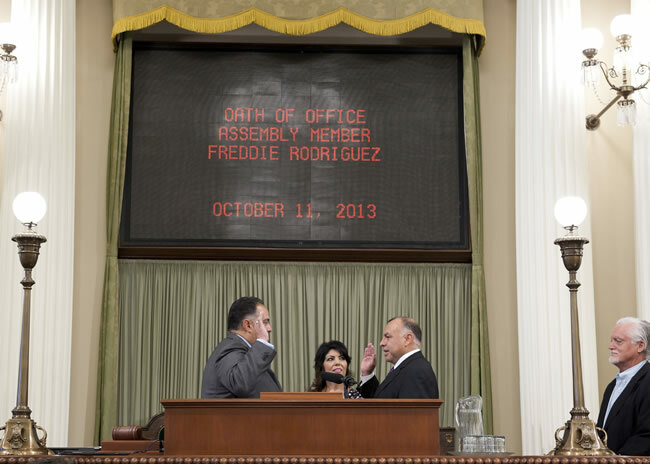 On October 11, 2013 I was sworn in as your Assemblymember by Assembly Speaker John A. Pérez. It meant a lot to me to have my entire family, especially my wife Michelle, by my side as I took the oath of office to represent the 52nd Assembly District. I have lived in the district my entire life and I am honored to be representing my home in the State Assembly. There will be tough decisions that my colleagues and I will have to make, but I will always remain focused on the top priorities for the Inland Empire. First and foremost, job creation and economic development are essential in our region. As your representative in the legislature, I will do my best to create opportunities for our communities to thrive and prosper. I will also work to ensure that we honor our commitment to public safety and expand access to healthcare and education for all Californians. I need to hear from my constituents. I want to hear your thoughts, ideas and concerns about issues affecting the 52nd Assembly District. My promise to you is that my door will always be open. I encourage you to drop by my office, send me an email or give me a call. Please explore the links below where you can read about California's budget outlook, our successful Turkey Drive and find important information on how to contact me. Together we can ensure that our community thrives.